Boosting your home’s curb appeal is a worthy venture. Apart from increasing your property’s value, projects that enhance the beauty of your home also improve your own experience of living there. Sure, you can upgrade your front door, invest in well-designed landscaping, or even get creative with your lighting. These small-scale projects will certainly rejuvenate your property, but these projects pale in comparison to what we are going to tackle in today’s blog post. Bradford Xteriors, your best roofer in Columbus, Ohio, recommends two major home improvement projects that help boost curb appeal—roof and siding replacement. A roof replacement project can be expensive and time-consuming, but the finished result gives your home a big boost in not just curb appeal, but also in performance and longevity. With a newly installed roof, you update the whole appearance of your home, making it stand out in your neighborhood. Also, roof replacement is often a more viable and cost-effective option than repair, especially if your roof is on the older side. Before you pursue roof replacement, be certain about it. Not all roofing problems require replacement — some, like a minor leak, can be resolved through repairs. However, roof replacement is probably the better option if the damage to your roof is so extensive that it compromises the structural integrity, safety and comfort of your home. Inspecting your roof from the ground using a pair of binoculars is a good place to start. Look out for signs of damage on the roofing materials, such as cracks, dents and curling. Check for loose or torn flashings as well. If your roof has these problems, it will be easy for rainwater to seep into your home, causing considerable water damaged when left unaddressed. Find out if the recurring leaks have been affecting a large portion of your home. Once you’re done with the inspection, it’s time to contact the best roofer in your area. Do your homework and find a company that is reliable, experienced and professional and can ensure a smooth home improvement experience. A licensed contractor knows what’s required in a roof replacement project, including the acquisition of necessary permits, and has access to top-notch roofing materials. On that note, be aware that the longevity and performance of your new roof will depend in large part on your choice of material. There are many options available today, so be sure to do some research about the advantages and disadvantages of each. A roof can account for 40 percent of a home’s curb appeal, so consider which material will best complement your home. Roofing material selections include wood shake, metal, asphalt shingles and concrete, clay, and slate tiles. The materials differ in terms of features, benefits, costs and, of course, appearance. Talk to your roof replacement expert to help you make the right decision based on your budget and on what you envision for your home. Another advantage of working with a reputable roofer is that they will walk you through the process ahead of time so you know exactly what to expect. Be sure that the pros you choose provide you a detailed contract that covers every part of your project. The contract should include the complete job description, start and end dates, change and work orders, schedule and terms of payment, and proof of insurance and bonding. Working with the best roofer with certifications from the top roofing manufacturers ensures proper workmanship according to quality specifications. It also gets you access to strong warranties. Solid coverages against poor installation and material defects give your new roof additional layers of protection. Apart from replacing your roof, another part of your home that you can improve to boost curb appeal is the exterior siding. With this project, you can transform the look of your home while also improving its energy efficiency and weather protection. Siding replacement is a good option if your existing siding nearing or has reached the end of its service life based on existing damage or deterioration. Remember that siding is a huge component of your home’s exterior, and can make or break your home’s curb appeal. The great thing about this home improvement project is that siding comes in a wide variety of colors, textures and profiles, making it easy to find an option that perfectly suits your personal taste and preferences. Siding replacement also gives you the opportunity to add some architectural details to bring new life to your property. Moreover, pursuing siding replacement helps boost your home’s energy efficiency. Added insulation on your chosen siding material will make your home more comfortable and will help lower your energy bills. The more heat reflected off your new siding, the less you utilize your heating and cooling system, resulting in energy savings and better indoor comfort. When investing in this exterior home remodeling project, it is important that you know what to expect. Before you start, explore ideas with your designer, drawing up an estimate that includes material costs, labor, permits and project duration. Prior to installing the new siding, your current siding will be torn off and your contractor will repair any existing damage to your home. When it comes to siding replacement, there are multiple options to suit every budget. This allows you to revitalize your home’s exterior regardless of budget. If you’re looking for a cost-effective and easy-to-maintain material, vinyl siding is your best choice. It can stand up to insects, pests and rot, and is easy to install. You can even find vinyl siding products that closely resemble wood. For a tougher and stronger material, choose fiber cement. Brick and stone are high-end materials that, while expensive, offer a solid appearance for your home and increased durability. Before you pursue siding replacement, it is important to do your research regarding the available options. Take note of the benefits and drawbacks of each. Also, take the time to find a qualified contractor to work on your project. 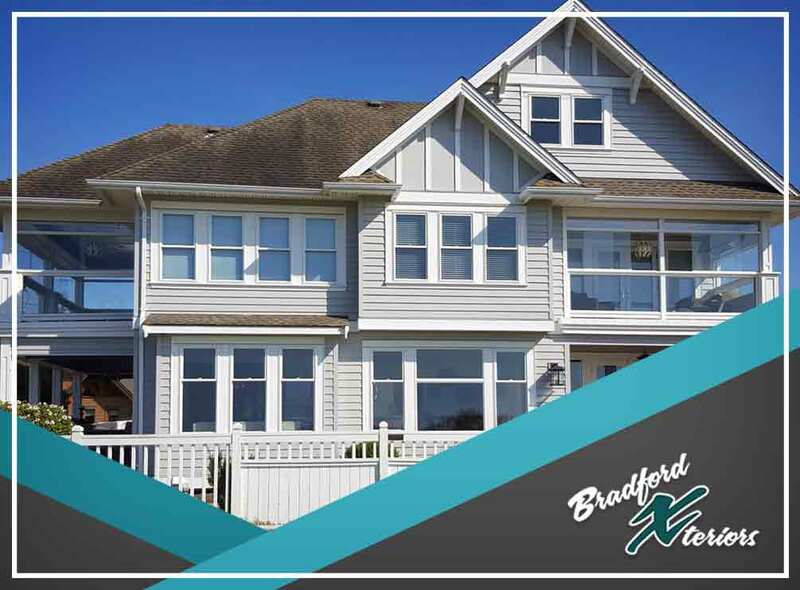 For your siding and roof replacement needs, turn to Bradford Xteriors. We have partnered with the most trusted brands in the home improvement industry, giving us access to top-of-the-line products. Expect us to carry out your projects with expert workmanship and an uncompromising commitment to earning your total satisfaction. Give us a call at (614) 328-8188 to get started. You may also fill out our contact form to request a free, no-obligation quote. We serve residents living in and around Columbus, OH.